Kun is the young son of an executive mother and an architect father. He loves his toy trains and playing with the family dog, Yukko. At age four, his younger sister is born. 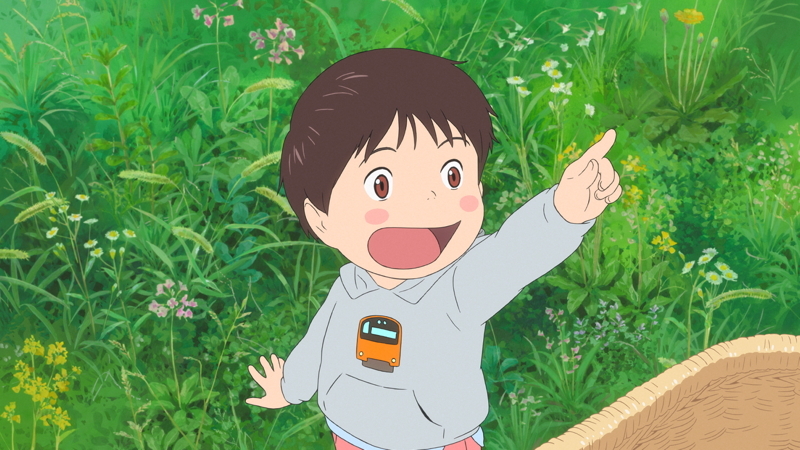 His parents later name the infant Mirai – the Japanese word for “future”. Kun is happy at first, but quickly grows jealous of the undivided attention Mirai receives, eventually having to be restrained from hitting her. From there, he lashes out at his mother for being gone all of the time and his father for focusing all of his attention on his work when at home. After one of his tantrums, he meets a strange man in the house’s garden who claims to have been the prince of the house before Kun was born. Shortly thereafter, he meets a young woman who seems to know him very well. On top of that, she tells him her name is Mirai. In a lot of ways, Mirai isn’t so much a singular narrative as much as it is a series of smaller stories stitched together. In the first vignette, Kun learns that the strange man in his family’s garden is actually Yukko, having turned into a human. This is evidenced when he whines about the poor quality of the economical dog food Kun’s parents began buying after the latter’s birth and spontaneously begins playing fetch. This eventually allows Kun to relay Yukko’s complaints, convincing them to buy the better dog food for him. The rest of the film follows this pattern. Kun throws a tantrum related to a significant event, he rushes to the garden, and someone or something tangentially related to his predicament shows up in the garden. When Kun is jealous of the attention Mirai gets on Girls Day, he runs back to the garden where he happens upon his sister’s future self. Worried about a superstition concerning the dolls she received on the holiday delaying her eventual marriage by one year for every day in which they are displayed on the counter, she asks Kun to distract his father while she and the humanized Yukko put them away. In many cases, I would argue such a work is better suited as a miniseries. However, in Mirai, making these events into a feature length film was very effective. This is because all of the stories, though surprisingly disparate in the themes they cover, ultimately benefit from being within the same, continuous narrative. You get a true sense of how Kun’s arc progresses throughout the film. One thing I have to commend this film on is that Kun is one of the more realistic four year olds I’ve seen in films. A majority of the time, children are written as though they’re miniature adults. Even if said writers remove any big words from their dialogue, they tend to come across more as the things adults reflecting on their childhoods would say – not actual children in the moment. Admittedly, this is something of a double-edged sword. Kun’s outbursts can be very grating, though it is justifiable in that he’s only four years old. In fact, part of what makes Mamoru Hosoda’s writing so compelling is how every time Kun has one of his outbursts, you can’t help but feel a little disappointed that he hasn’t fully moved past his shortcomings. In fact, this is an approach to character development you don’t see often in fiction. Rather than having one magical, life-altering event prompting the hero to become a better person, he improves himself over long periods of time in smaller ways. It does stand to reason because oftentimes in real life, people don’t change overnight. The road to becoming a better person involves actively fighting that which was holding you back beforehand. I get the feeling that anyone who has gone through long periods of bettering themselves can relate to Kun’s arc. What I feel to be one of the strongest aspects of Mirai is how much it succeeds at providing an ambiguous narrative. 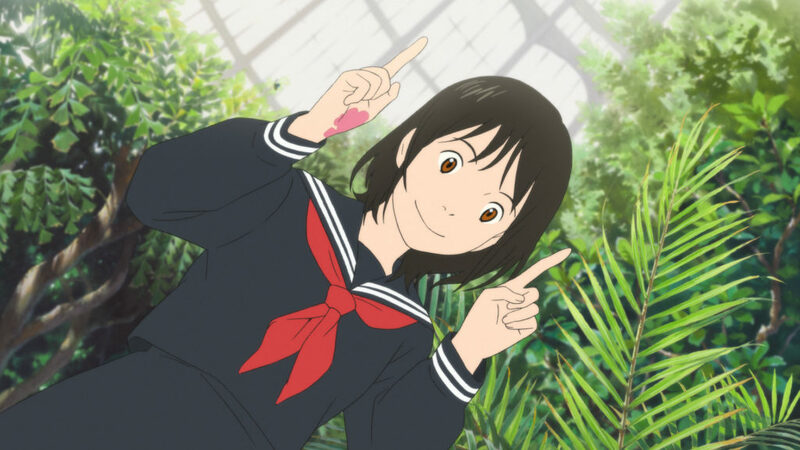 Unlike in Mr. Hosoda’s previous films such as Wolf Children or The Boy and the Beast in which the fantastical elements were objectively real, Mirai notably equivocates on this subject. Is Kun really going on these fantastic journeys or is it a mere fantasy he concocted as a coping mechanism? One of said journeys involves him meeting his mother’s past self, and it seems highly unlikely that she would never comment on the striking similarity between a random boy she once met and her own son. The latter perception is further enforced earlier when Kun supposedly rips human Yukko’s tail off and puts it himself. 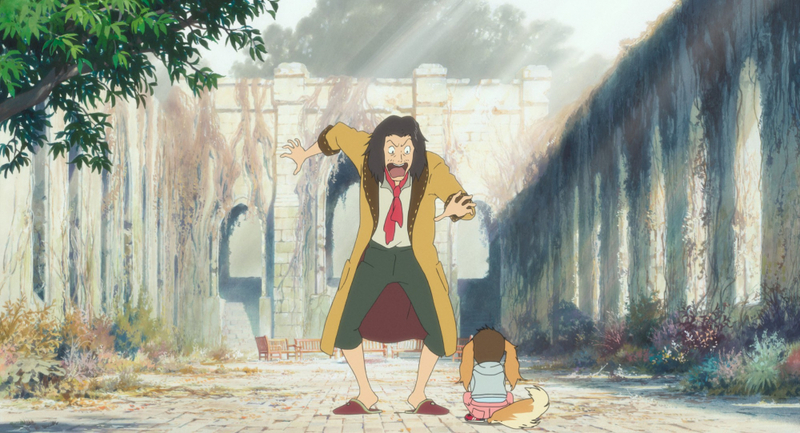 His parents fail to notice their son has grown a tail, whiskers, and dog ears, instead believing that Yukko is acting crazy. So while these events would appear to provide a clear victory for the “all in Kun’s head” theory, the answer is actually far from clear-cut. After all, how did Kun learn that Yukko hated the economical dog food? This isn’t the kind of thing most four-year-old kids would notice, and Yukko’s delight upon being given the high-quality food suggests he really did hate the economical brand. To muddy things further, one segment involves Kun being transported to a workshop in rural Japan after failing to ride his bicycle without training wheels. The young man he meets there introduces Kun to his horses. Though Kun is initially afraid of the horses, he rides on one when encouraged by the man. Later, he takes him on a motorcycle ride across the tranquil Japanese countryside. This gives Kun the courage to successfully ride his bicycle, using what he learned from the young man. He later discovers a photo of the young man in the family album and his grandmother identifies him as Kun’s great-grandfather. His grandmother’s reaction implies that Kun had never seen this photo before, yet he was able to identify the young man instantly. How could he have identified someone he never met? It’s probable that Kun met his great-grandfather in person before his death, but there is little chance he would have recognized him as a young man. Ultimately, it doesn’t matter because this odd reality perfectly matches how a four-year-old perceives the world. While some works dither when asked what is or isn’t real, Mirai doesn’t even raise the question at any point, and I think that’s to the film’s credit. In fact, what I particularly like is how Mirai doesn’t leave any stone unturned when it comes to exploring its premise’s underlying implications. This comes to a head in the final act. Distraught over being unable to wear his favorite pair of yellow pants for a day trip due to having not dried completely, Kun threatens to run away from home. Conveniently, a train appears in his garden. A teen warns Kun not to board, but he refuses to listen. The train then takes him to Tokyo Station. Though delighted that he finally gets to see the real-life counterparts to his toy trains, he quickly begins to panic when he realizes he is all alone. As soon as this sequence begins, you know that it’s not going to be like any of the preceding ones. When the train rolls in, it appears to be in live-action, which clashes horribly with the art style in a deliberate invocation of the Uncanny Valley effect. Things only get worse from there when, in a last-ditch attempt to return to his family, he speaks with a lost-and-found officer. The mechanical attendant looks as though he stepped in from a completely different film, speaking in a robotic tone and moving in a decidedly non-human fashion. Despite his immensely off-putting appearance, he promises to reunite Kun with his family under one condition: he must provide a name. This is where Kun’s self-centered reality comes back to haunt him. Like many little kids, he only ever thought of his family members in relationship to himself rather than as unique individuals. As a result, he doesn’t even know the names of his parents. Because there is no one to claim him, he, like every other kid without families, is condemned to Lonely Land, which is implied to be hell. This moment is powerful because the audience themselves have no idea what the right answer is; Kun’s parents were never named. In fact, the only three characters who are named are Kun, Mirai, and Yukko. To enforce the lack of nominal emphasis, Kun’s own name sounds very impersonal. “Kun” is usually an honorific people use in Japanese when referring to male children or teenagers, making it an odd choice for a given name. By doing so, he is effectively a stand-in for any kid of that age. It is, then, highly fitting that he takes the first step towards becoming his own person by preventing the infant Mirai from boarding the train leading to Lonely Land and acknowledging that he is her older brother. This response is deemed acceptable by the officer and Kun is allowed to leave. From there, the future Mirai shows Kun the most defining moments of his family members’ lives, allowing her brother to see them for who they are, not just what they are to him. His great-grandfather served in the Second World War when the ship he was on capsized as the result of a devastating air strike. He had to swim through a sea littered with debris and the corpses of his fallen comrades with a maimed leg to live. Had he even been slightly less determined to escape his fate, Kun, Mirai, and the rest of their family members would not have even existed. Kun’s mother stopped liking cats after seeing a stray one kill a bird. Had she not witnessed this, she may not have adopted Yukko. After the war ended, Kun’s great-grandfather ran a race against the woman he loved despite his injury. Had Kun’s great-grandmother not let him win, their family as they know it would not have formed. As a final coda to his character development, Kun’s yellow pants emerge from the dryer. As they could be seen as the last lingering thread of his past self, it’s highly fitting that his final act is to go on the day trip wearing the less preferable blue pants instead. He reconciles with his family, and all is well. Mirai is the kind of film that needs to be studied if you’re to craft a story with such a young protagonist. In the hands of a less-skilled writer, its lead would’ve been completely insufferable, making it impossible to care about him. As it is, Mirai doesn’t shy away from the obnoxious behavior that comes with the territory of being a four-year-old. While you may dislike the lead during his more questionable moments, you’re always holding out hope that he will be able to improve himself. At the same time, Mirai makes the case that while self-improvement is possible, there is no quick fix, and it’s a road plagued with moments of relapse into the person you once were. It’s ironic how an animated film with a four-year-old lead manages to be more mature than several live-action ones featuring entirely adult casts. It is for these reasons and more that I can recommend watching Mirai. If you have yet to see a feature-length animated film from Japan, Mirai would be an excellent introduction. Then again, Mirai is the kind of film I could recommend even to those who aren’t animation fans. It takes the audience on the kind of journey that could only have been crafted in this medium, and you will be fascinated every step of the way. ← November 2018 in Summary: 150 Game Reviews! 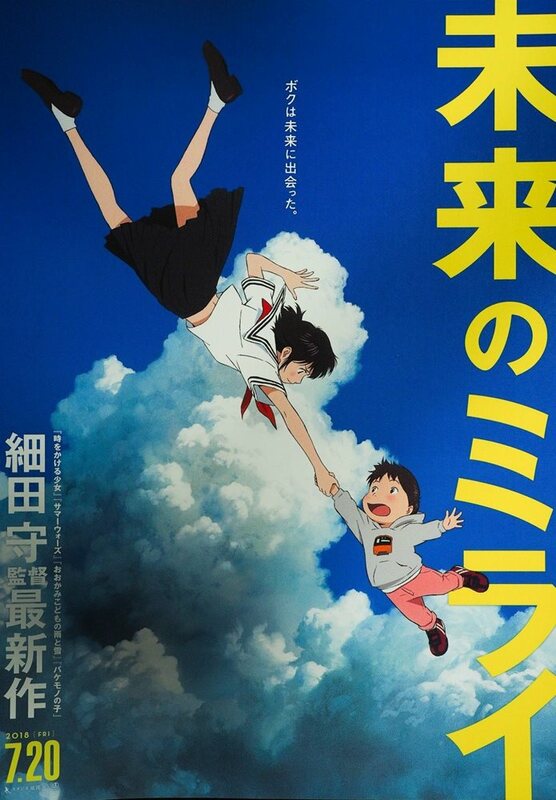 I’ve been very fond of Hosoda’s films since Summer Wars so I’ll be checking this one as soon as I get the chance, sadly that chance will probably be a long time coming since rarely I see cinemas in my country hosting Anime films not to mention that getting any kind of anime in Europe is an excruciating exercise in patience because of licensing. Getting back to Hosoda, even though Summer Wars is in some ways his weakest movie, It is in some ways my favourite because of the kind of family atmosphere it builds, it gives me nostalgia from when I would get together with my cousins. Something that just doesn’t happen anymore. Interesting. Do you feel he was still finding his stride during Summer Wars? If you’re a Hosoda fan, I get the feeling you’ll be impressed with Mirai. In all honesty, they’re not much better at screening anime films in my neck of the woods either (or foreign films for that matter), so when I saw this opportunity present itself, I took it without hesitation. Nice write up! I’m a big Hosoda fan so naturally I’m itching to see this one but whilst it did get a UK cinema release it was not at any cinemas near me! I live a 10 minute walk away from a 7 screen multiplex yet they never have anime or top foreign language films there (only a few Bollywood films that they screen at night) which is SO frustrating, meaning I (and many others) have to wait for the home video release instead. Ah, I was wondering if the “let’s not bother screening foreign-language films” thing was an endemically U.S. problem, but judging by what you have to say, the answer is apparently no. Anyway, there was a one-time-only screening near where I live, so I took that bull by the horns. If you get a chance to see this film, take it! Unfortunately, whilst there has been a breakthrough over the past decade or so for World Cinema here in the UK there is still a huge stigma about subtitled films being too “arty” for mainstream audiences. Whilst some of the bigger cinemas might accommodate the odd film here and there, theatrical release remains limited to certain cinema chains and locations – usually the big cities – so most of us miss out. I can believe the pet’s opinion on food. At work someone commented that her cat only eats one brand of cat food. A mini-series made by Hosoda would be cool. I am a big fan of Wolf Children and Girl Who Leapt Through Time. Will have to check this film out, even if I do find kids (in real life and fiction) to be a tad annoying. I could totally get behind a Hosoda-directed miniseries. He could flesh out these ideas even more. Then again, I have to admit it’s impressive how much ground he managed to cover in a 98-minute feature. And I know what you mean; one of my own cats is a rather picky eater, though they both seem to have a selection they do/don’t like.